We’re living in an awesome era where despite geographical distances, we can reach out and help others who are experiencing the same unique struggles that we do. With the help of affordable – and oftentimes free – digital tools, simply sharing our stories can help many around the world who may not know anyone in their physical location who can relate. I wrote an ebook about this when I discovered this wonderful fact about social media after launching of my podcast about stuttering. As a truly immersive medium, comics are a great way to engage and touch lives. 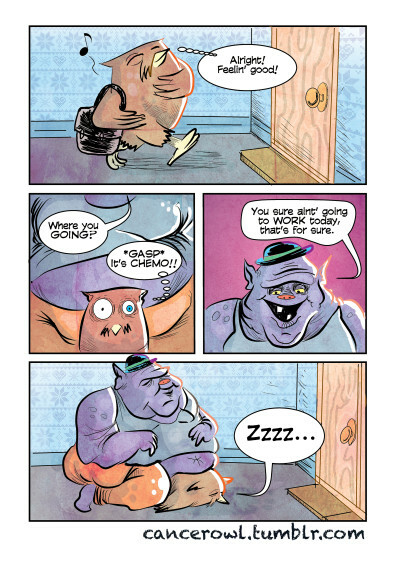 I’ve recently came across a beautiful digital comic called Cancer Owl created by Matthew Mewhorter who is currently undergoing cancer treatments. Matthew turned to drawing comics about his treatments as a way to cope and share with others who are also going through or went through the same experiences. 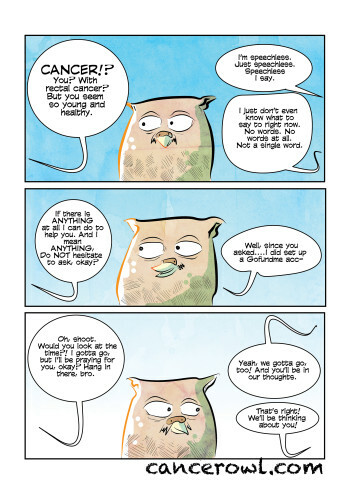 Appearing in his comics as himself drawn as an owl, Matthew’s comics give poignant insights and humour on thee reactions he’s had from loved ones, to deciding how to tell his loved ones about his diagnosis. Owls have always been my favorite animal. Fascinating creatures, really. From having eight eyelids, to their extreme night vision, to their stoic presence and keen observational ability. I love how some view owls as wise, while certain cultures view them as good luck. Plus they’re so expressive and gosh darn cute. Also, owls are up there in animal internet popularity with cats and sloths, and I figure that there might be more eyeballs on the strip with an owl rather than just drawing myself. 2. 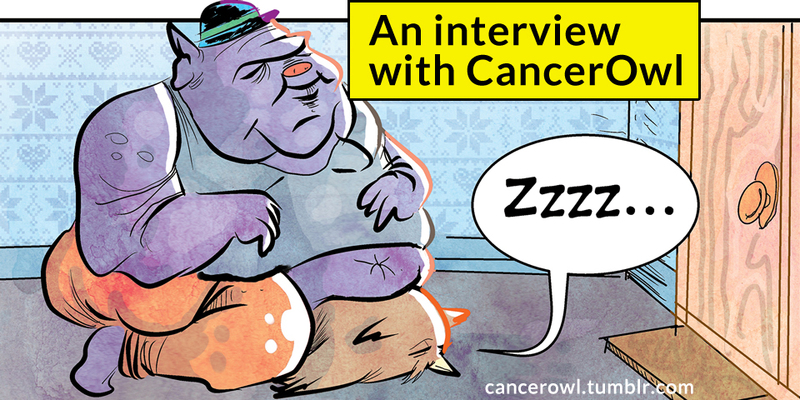 How did you come to choose to share your comics about living with cancer with the world? It started as an art journal my therapist recommend I do as a way to cope. I began drawing comic strips because it’s always been my favorite medium of expression. It’s so creative, brief and direct. I looked up cancer comics and found that there weren’t any that I could find. So, I figured if anyone should have such a powerful way to communicate the cancer experience, why not me? 3. 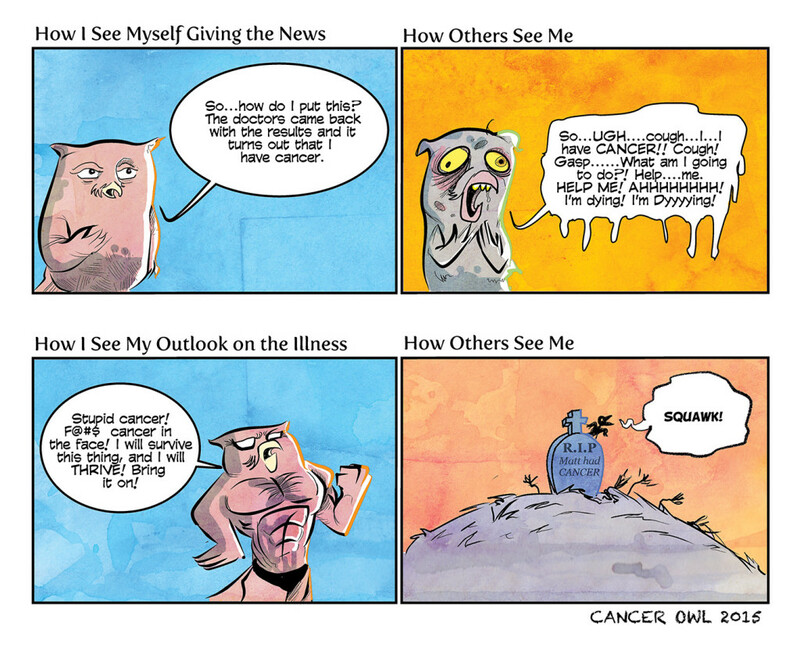 How has drawing and sharing your comics about living with cancer helped you cope? Has it helped your family and friends as well? For one, I’ve been able to be absolutely honest about the experience which in itself is healing. Drawing such a direct medium of communication, it’s caused me to flesh out exactly how I feel, and be able to communicate to people without cancer about what it’s like in a way they might actually pay attention. Secondly, it has helped me connect to SO many cancer patients and survivors. Every one of them has thanked me and encouraged me to keep going. Knowing I’m not alone in the experience has been so refreshing and healing. And conveying it all in such a vivid way has helped my friends and family to have a deeper understanding of someone in my position. I’ve noticed that they have been able to engage me in a deeper way. 4. I see that you currently work as a therapist. Have you used your artwork in therapy sessions? 5. What kind of feedback have you received from readers regarding your comics? Feedback has been quite overwhelming. As I said earlier, many cancer patients and survivors write to thank me. But I’ve also had family members of people who suffer or have died from cancer letting me know how I’ve captured the experience so well. I’ve had many people tell me the comic has caused them to laugh like crazy and others tell me that they’ve cried reading the comic. I only had one complaint so far. It was an old friend who was offended by a strip that poked a little fun at people who offer to help, but resort to “I’ll pray for you” when a way to help involves money. He was angry because I think he thought I was making the comic about him (I wasn’t), and he seemed to feel guilty about not donating money to my fundraiser. 6. Do you ever worry about “crossing a line” with making a joke about living with cancer? I only worry about crossing a line with cancer patients, because really, this comic is primarily for them (and me, obviously). Everyone else, not so much. I don’t really feel like I’m crossing a line as long as I tell my story as honestly as possible. In fact the more frank and honest I am, the more I have cancer patients, survivors and caretakers thanking me. I imagine that the people I risk offending the most are those who throw out unhelpful, token phrases as well as those are just plain clueless or insincere. And honestly, I really don’t care if I offend them. I kind of hope I do, and then maybe they might get past their offenses, and then become more helpful with those fighting cancer. But if I have my fellow survivors telling me I’ve crossed a line, I will most certainly pay attention. 7. Can you share advice for anyone looking to start a comic journal much like how you did? It’s the same advice my therapist gave me: do it primarily because it’s good self-care. This means that your comic/journal should be for YOU first. If you have a malady of any kind that impairs your daily living or threatens your life, journal it first and put all of your most raw and honest feelings down in a sketchbook/journal. If it isn’t therapeutic for you, it won’t be therapeutic for anyone else. Take the brilliant webcomic/blog Hyperbole and a Half for instance. You are really just reading the therapeutic expressions of a woman battling depression. If she glosses over the challenges in any way, she won’t connect with those who also battle depression. So, when I write about having cancer, I must tell the truth, or else I rob others battling cancer the permission to be free in their journey. Plus, pick a style that works for you, a style you can do consistently. You don’t have to be a great artist, just a great storyteller. And every great storyteller embraces their pain and finds freedom in it. Don’t let anyone bully you into censoring your experience just because it makes them uncomfortable. 8. Where are you now with your cancer treatments? I’m post-radiation treatment and post-resection surgery. I still have an ostomy bag, set to be reversed close to Christmas time. I’m also taking chemotherapy, 9 days on and 5 days off for 5 months, to kill off any rogue cancer cells that still might lurking in my body somewhere. But as I write, my prognosis is “excellent” and all 18 lymph nodes tested at the time of my surgery tested negative! Right now, I deal with a ton of fatigue and nausea while working full time as well as being married and a father to a 2-year old. It feels like a forever stretch, but I’m almost done. It’s been a wild year since my diagnosis! A big thank you to Matthew for allowing me to share his story and his comics for my blog. Check out his comics at cancerowl.com. Matt is my son. I know that he has been through so much. I am very proud of him for the strength and courage he has shown. He has a real heart to help others and I am so happy that he has found CancerOwl as a way to do that. He is truly gifted at what he does. He is indeed! And through his strength and courage, he is helping others around the world.